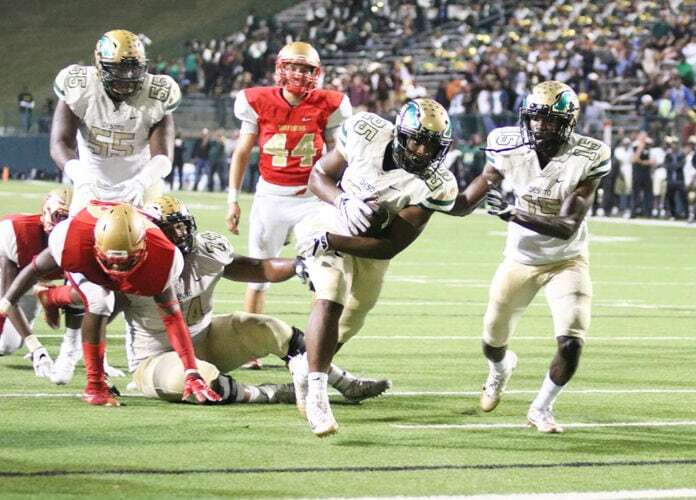 GRAND PRAIRIE—Thursday night was a real nail-biter for DeSoto fans, players and coaches at Grand Prairie’s Gopher/Warrior Bowl. A combination of television cameras, playng an away game on a school night all worked toward the Eagles having a tough time to keep their season unblemished. 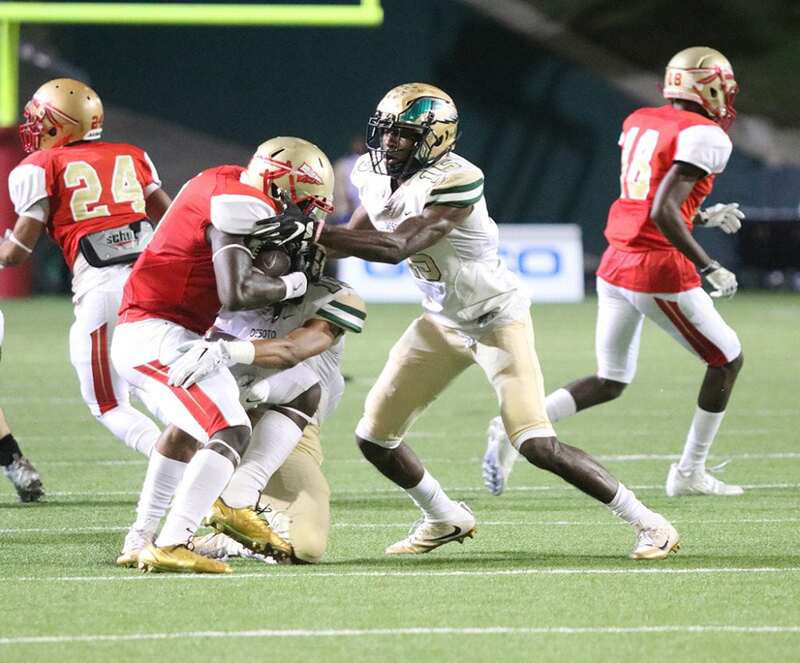 One thing is certain – in a match-up between undefeated DeSoto and South Grand Prairie (6-3), there was no way the Warriors were ever supposed to keep up with the high powered DeSoto offense. DeSoto Quarterback Shawn Robinson drew first blood in the Eagle opening drive with a 13-yard touchdown run. Dyamond Woods then successfully turned a fumbled snap on the extra point kick attempt into a two-point conversion giving Eagles a very temporary eight point advantage. Grand Prairie answered right back when Free Safety Atanza Vongor returned the kickoff 75 yards for a touchdown and cutting the lead to a single point. The rest of the first half then belonged to the Warriors as they took a two-point lead into halftime, 17-15. Surely DeSoto Head Coach Todd Peterman had some choice words for his players during the half, because they returned to the field on fire. Robinson launched a 24 yard bomb to Laviska Shenault, Jr. to regain the lead, which they never lost, in spite of getting into a bit of shootout with the South Grand Prairie offense. During the second half, Robinson rushed for 99 yards. Jammonne Williams (36 rushing/19 passing) and Kelan Walker (76 rushing) both contributed a touchdown during the second half. The game was broadcast nationwide on ESPN2 as part of the GEICO ESPN High School Football Showcase. One almost needs an advanced mathematics degree to decipher the University Interscholastic League (UIL) playoff matrixes. After comparing stats and slight point margins, Best Southwest 6A football fans have a number of teams in contention. After losing two games and their star quarterback to injury, the Duncanville Panthers had a strong finish to the season and earned a playoff berth for the first time in five seasons. During their last playoff appearance in 2011, the Panthers fell to powerhouse Euless Trinity, 55-36 in the first round. Even after falling to DeSoto, the South Grand Prairie Warriors still get a playoff nod after Grand Prairie fell to Duncanville, 30-20 on Thursday. Both South Grand Prairie and Duncanville will remain in Class 6A-Division I. Cedar Hill and DeSoto will have top seeds in 6A-Division II. DeSoto fans have even more reason for cheer. After four straight years of falling to the Allen Eagles, DeSoto’s season finish makes them #2 ranked in the state and there for the top seed for Division II. Allen (9-0) remains #1 ranked in the state and leads Class 6A-Division I. The yearly Eagles clash proved some of the most excited playoff matchups. 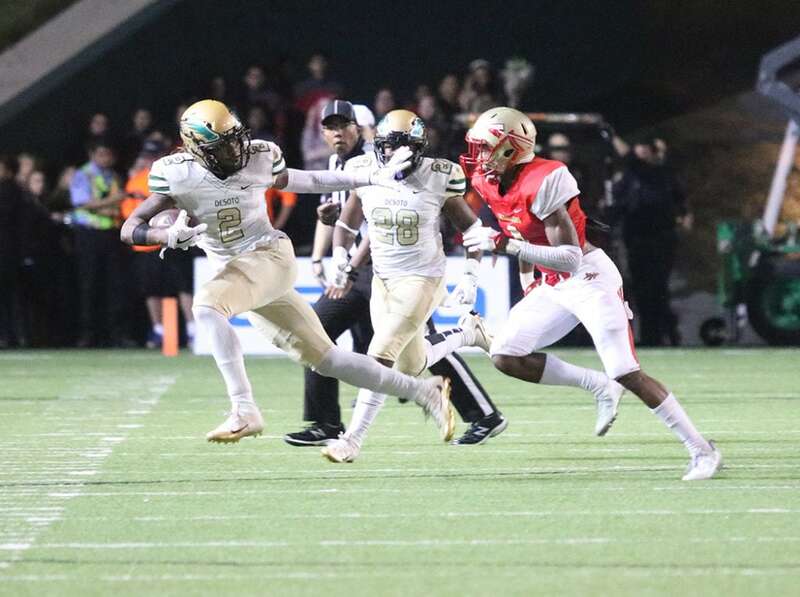 Unfortunately, DeSoto fans always went home with their postseason dreams dashed. Perhaps Christmas came early for DeSoto. Let’s see what they do with this opportunity. They will first face off against Copperas Cove/Killeen. A place and time has yet to be determined.